Acrylic paint can be applied to any media and the rich paint colors won't fade when exposed to light. 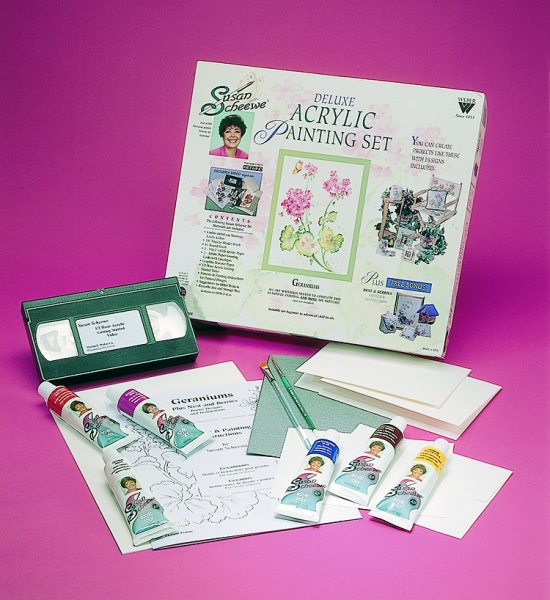 Try your hand at acrylic painting with this deluxe art set and instructional DVD from Susan Scheewe. Regardless of your skill level, Susan will address techniques you can master and the kit will supply you with everything you need to get started. This kit includes (6) 37ml tubes of rich nontoxic acrylic colors, two sheets of 9-in. x 12-in 185 lb. artist's paper, 2 brushes, comprehensive patterns, wax free transfer paper, two paintable greeting cards with envelopes, painting instructions for 2 designs, a reusable storage tray and box, and to top it all off, a half-hour Susan Scheewe Getting Started video on DVD!